Could New SSBN Program "Sink" U.S. Navy? Could the purchase of new SSBN’s reduce the size of America’s fleet to dangerously small numbers? The immense cost of the Ohio-class replacement program to build the United States’ next generation ballistic missile submarines (SSBNs) threatens to jeopardize the rest of the fleet, Navy leaders and lawmakers are warning. The program envisions replacing the current 14 Ohio-class submarines with 12 new SSBNs that will have reactor cores that will last the entire service life of the vessels, meaning each submarine will spend less time in maintenance. Still at a cost of anywhere between US$4-6 billion a ship, the expense of this program will be an immense burden on the Navy’s shipbuilding budget. Indeed, although the procurement phase of the program isn’t scheduled to begin until FY 2021, the Pentagon’s proposal for its FY 2014 budget already calls for appropriating US$1 billion for R&D purposes. At an industry breakfast last week, Vice Adm. William Burke, the outgoing deputy chief of Naval Operations Warfare Systems, said the cost of the program would undermine the Navy’s ability to field a 300-ship fleet during the procurement phase that stretches from FY2021 through FY2035. “If we buy the SSBN [the planned 12 replacement strategic submarines for the current 14 Ohio class now in service] within existing funds, we will not reach 300 ships. In fact, we’ll find ourselves closer to 250. At these numbers, our global presence will be reduced such that we’ll only be able to visit some areas of the world episodically,” Vice Adm. Burke said, the Washington Post reported. Vice Adm. Allen Myers, deputy chief of naval operations for integration of capabilities and resources echoed Burke during a Congressional hearing on April 24: "It's an understatement to say that that's going to challenge us…. It challenges our shipbuilding account, and it challenges us when you look at that time frame." The U.S. is not the only country struggling with the enormous costs of maintaining a nuclear arsenal, of course. Still, this strikes at the very core of the USN’s twin missions of being both the holder of the most survivable leg of the U.S. nuclear triad, and a global navy capable of projecting force across the world. In light of this, some lawmakers are proposing that the nuclear submarines be funded at least in part outside the Navy’s normal shipbuilding fund, while the Navy is considering purchasing some ships earlier than currently scheduled to leave the shipbuilding fund open during the Ohio-replacement program’s procurement period. 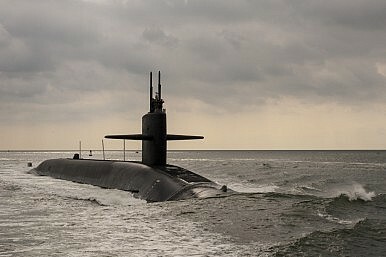 Whether the Navy can reduce the number of SSBNs all depends on the outcome of the nuclear policy review the Obama administration is reportedly conducting. Predictions are hard; especially about the future.